Liverpool’s James Milner had a turbulent time after coming on as a substitute for the Reds today, the veteran made up for his mistake by converting a crucial penalty. 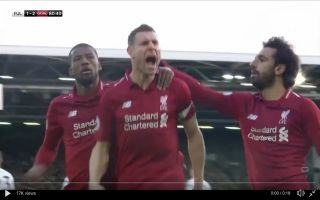 At one point it looked as though Fulham were about to deliver a massive blow to Liverpool’s hopes of winning the premier League title, former Liverpool attacker Ryan Babel scored for Fulham in the 74th minute of the match after Milner’s sliced clearance led to a mixup between Alisson and Virgil van Dijk. Check it out here. Fortunately for Milner he had the chance to make up for his mistake less than 8 minutes after, the retired England international stepped up to take a penalty after Fulham keeper Sergio Rico recklessly pulled Sadio Mane back after spilling a shot from Mo Salah. Milner stepped up with the weight of the entire team and fanbase on his shoulders but the veteran dealt with the pressure expertly by firing his penalty down the middle and into the back of the net. Milner’s great record from the spot continues. Liverpool made a very lucky escape today, they were bailed out by Rico’s error.